We shall see, but (ulcerative colitis and some food allergies aside) I think the true cause of years of my health problems is about to be revealed. I go to my doc in a few days and will get an MRI done to assess what’s going on with my neck. At this point it appears the most intense “allergic reactions” I thought I was having to the HT were actually nerve pain and respiratory symptoms emanating from my cervical (upper) spine. Wearing a foam neck support for a few days has helped a lot, especially as a diagnostic tool. I was intrigued to read there even seems to be a connection between TMJ and cervical spine injury. My chiropractor suggested I do some imaging studies, and thought a narrowing of the channel for the spinal cord in the my neck, or “cervical spinal stenosis”, might be the culprit: nerve pain in extremities, and muscle weakness, plus low blood sugar episodes, tinnitus, anxiety, and poor muscle coordination at times. Even my “exercise intolerance” may be related, since the movement of walking, and especially running, aggravates this fragile part of the body. In my case, a few minutes of brisk walking was enough to trigger a very stuffy nose, and an asthma-like attack, which would make my heart race. A cold sweat often followed. Vitamin C worked as a powerful medicine for this “worm flu” I thought I was having, due to its anti-inflammatory qualities. I can confirm it still works, and for the nerve issues, because when the pain and other symptoms are at their worst, the same moderately high doses of vitamin C (five to ten 1,000 MG tablets) clear it up quickly. From what I can gather now, the only side effects of mine that appear related to the helminthic therapy is some diarrhea (with attendant dehydration), and fatigue. Neither appears totally resolved yet, at this, day 69, but it’s much improved from a month ago. If I’m lucky, maybe the HT will help reduce inflammation in my neck on an ongoing basis. During my bounce, in week one post-hookworm and whipworm inoculation, I felt incredibly good, and was quite active. So let’s go, worms. Onward and upward! Overall, my progress has been quite good with helminthic therapy, but tonight (day 58 post-inoculation) I had another allergic episode. It wasn’t as bad as some have been in the past, but I did need to shovel down a fair amount of vitamin C, maybe ten 1,000 mg tablets, though the course of it. This was unpleasant, as always, but I was able to gather what seems like really important information from the event. It occurred to me these attacks always happen around the same time — mid afternoon to early evening. I wondered if maybe the helminths tend to be more active during those hours. Then another conclusion presented itself: low blood sugar. Most of the recent “worm flu” events I’ve had are consistent with getting caught up in work and skipping meals. On the days where I’ve been less focused on tasks, and eating solid meals, I seem to do just fine. So I quickly fixed a bowl of yogurt, added fresh blueberries, a dash of stevia, and a shot of whipping cream, for some extra calories. Not ten minutes later, my allergic response (congested nose, tinnitis and tightening throat) disappeared. That got me wondering if there might be a connection between low blood sugar, histamines, and generalized allergic reactions. Lo and behold, there seems to be a solid correlation. In fact, the more I looked, the more it appeared to be the case — autoimmune issues, histamine intolerance, food and seasonal allergies, may be exacerbated by a lack of “fuel” — even conditions as far-ranging as narcolepsy. So next time you feel that “worm flu” coming on, take some time out and feed yourself. And if you want to steer clear of it all day long, eat frequent small meals with plenty of protein, as this is the best way of coping with hypoglycemia, from what I’ve read. So I’ve got 55 hookworms now, Necator Americanus to be exact, and 500 Trichuris Trichiura whipworms. Together, they brought about a growing and intense well being, starting a day or so after I was inoculated. I could breathe through my nose, fully, for the first time in many years. I could smell the chill in the morning spring air as I made my way outside, amidst a torrent of tree-fluff allergens that would have had me gagging with asthma, and running for HEPA-filtered air, just days earlier. Shortly thereafter, the skin on this 40-something’s face was becoming soft and smooth, not rough and inflamed, as it has been for so long. What a time machine. I ran my fingers through my hair, which even felt a bit softer, too, and noticed the seborrheic dermatitis was easing. The scaly patches that had dogged me since my late teens were giving way to a normal scalp, the redness around my mouth and nose was becoming clear and… normal. Never before has “normal” been such a wonderful word. I tried wheat, and sugar, even beer, and tolerated all of it. Merely days ago this forbidden menu might have sent me to the ER with a flare of ulcerative colitis. Yes, it can be dangerous to throw caution to the wind, and make such drastic changes, so I soon backed off the accelerator, and stuck with my low carb diet. But it was an incredible triumph to have a bread pudding… and live to type about it. This “bounce” lasted for five glorious days. Then, as quickly as it came, it went. Such euphoria is a normal reaction to helminthic therapy, as I’ve come to understand, for a small and lucky subset. Some who do “HT” never bounce at all, so in this sense I felt doubly fortunate: first, to be successfully hosting them, and second, to have had such a strong initial response as they entered my bloodstream. Inoculation day was April 25, 2011. I took two hookworm doses over two days — 35, and then 20 more. 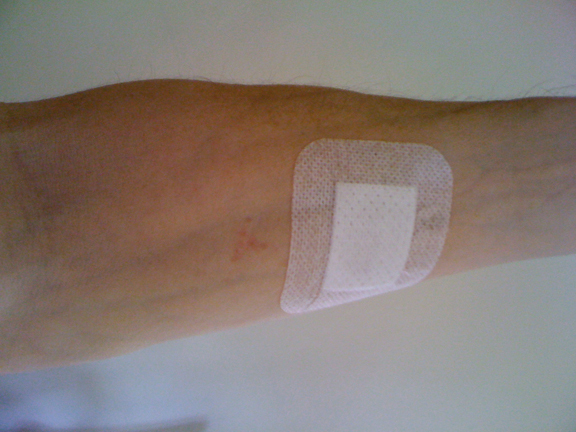 About 15 minutes after application, a “ground itch” developed at their entry site on my arm, which was quite mild. I also drank a tiny vial of 500 Trichuris Trichiura human whipworm ova on day one, which were suspended in saline solution. Apart from the concept, their entrance was utterly uneventful. *Gulp* Bon appetit.